In additional, our Recycling dryer is suited to dry extrudate,bugles,tortilla chips,doritos, 3D pellet snack, dog chewing food, especially for those requiring low temperature and short time dry. 1. Integrating frying and de-oiling with conveying under compact structure. 2 Controlled by PLC, high automation. 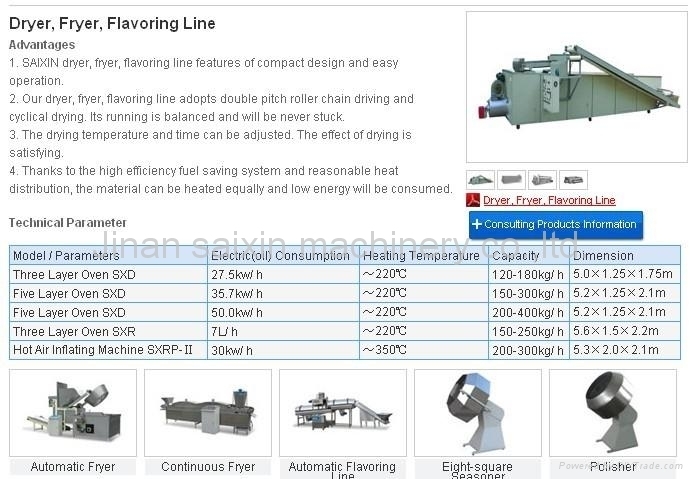 3 Advanced temperature controller and stirring device have the frying to the optimum. 4 Diesel (gas) burner ensures temperature up quickly with high thermal efficiency. 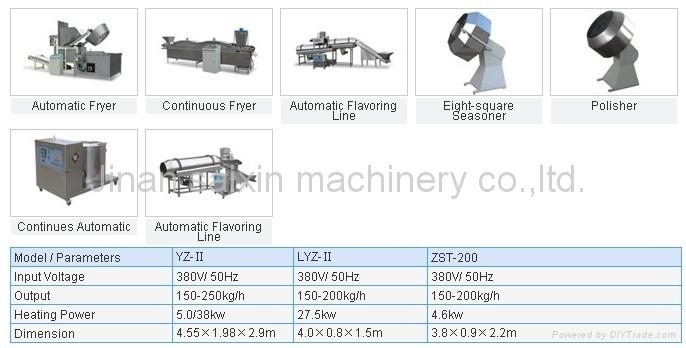 5 Automatic and manual operation are available. 1 Composed of elevator, roller seasoner, oil sprayer, and automatic powder sprayer. 2 Reasonable designed stirring teeth in the roller seasoner make it mix equally and easy to clean. 3 Advanced temperature control device in the oil sprayer makes the temperature adjustable according to different materials. 4 Overflow valve and air control the spraying volume and area of spray gun. 5 Lengthened screw in the powder sprayer conveys seasoning much equally. 6 Stainless steel structure keeps fine hygiene.